Households are recruited to OzTAM’s metropolitan panel via a large-scale Establishment Survey, administered by Nielsen TAM, that defines the population to be represented and its characteristics. This survey is carried out continually and involves thousands of interviews each year. The survey selection process is random and every private residential household in OzTAM’s coverage area has a chance of being chosen for interview. Panel homes are then selected from the survey respondents. The household recruitment process is carefully managed to ensure the panel is an accurate representation of the overall population OzTAM provides data for. The panel’s characteristics are also continually monitored against external benchmarks, such as Australian Bureau of Statistics data, and households are turned over periodically. There is also a panel for the national subscription TV (STV) market, which comprises 2,120 subscription TV homes drawn from the metropolitan and Regional TAM services. 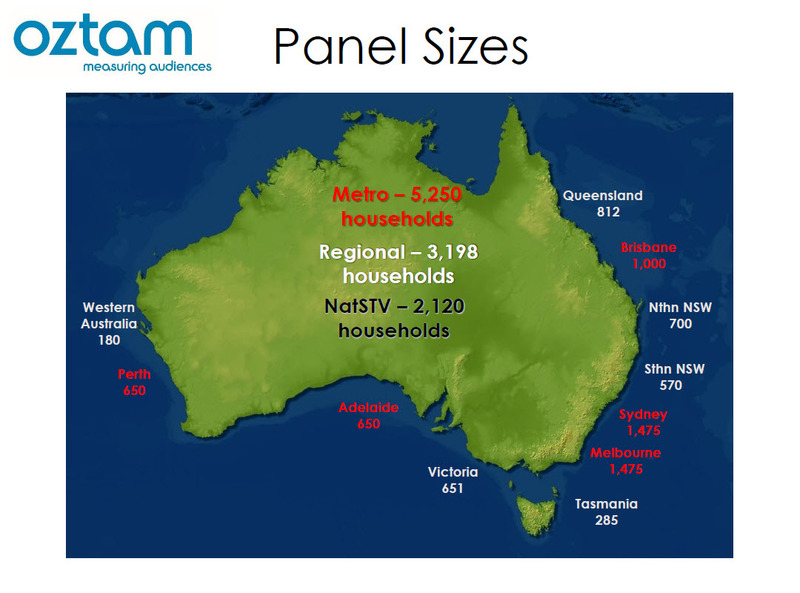 In terms of sample size relative to the population represented, OzTAM’s panel has long been among the world’s largest. In 2017 OzTAM's metropolitan and national STV increased by 50 per cent (from the previous 3,500 and 1,413 homes, respectively), recognising Australia's population growth and the fact people now spread their viewing over many more television channels. Alongside Regional TAM's own expanded panel, Australia has become the world's largest per capita people metered market. The maximum period of time that a household stays on the OzTAM panel is four years. Panel homes may elect to leave the service at any time and OzTAM replaces panel households as required to maintain statistically robust reporting. Please note OzTAM uses a different methodology to capture viewing of internet-delivered TV content. Please see the Video Player Measurement section for further details. In 2017 Australia has become the world's largest per capita people metered market.